Creating a beautiful tablescape is all about picking a china pattern and enhancing it with stemware, decor and lastly a delicious meal. This tablescape is extra special to me because it is an old china set that I have from my mother. It is absolutely gorgeous Limoge & although it can no longer be bought in stores, it is a classic look that stands the test of time. This is an example of how to dust off an unused china set and make it the center of attention for any family celebration. 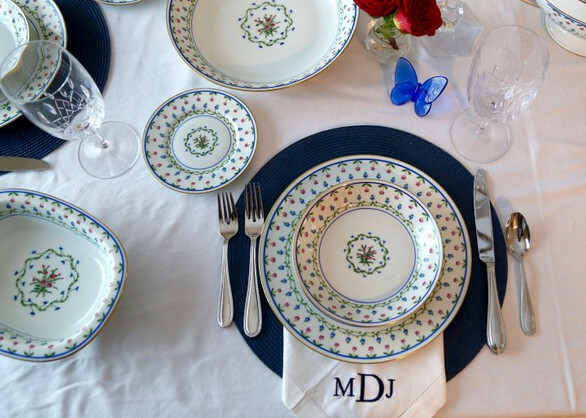 By using a placement it creates a distinguished place setting for each person. For White china sets ANY color placement will work. Fold it to be placed UNDER dinner plate. Crystal Candle sticks ( glass will work too) I used white candles as well. Because the Limoge china pattern has multiple colors and lots going on, the focus for this tablescape was the pattern, along with a pop of color with the small delicate red roses. I also used a baccarat blue butterfly to accent the table, but not a necessary addition unless you have other items in your house that accent the china set you are using. I allowed the china pattern to be the center of focus and it created a beautiful tablescape , great for any celebration!